1. Select your video source. You need some sort of device connected to your computer. This could be a camera directly connected, a capture device (i.e. Black Magic or Matrox unit), or you could have a PCIe card installed into your chassis that is HDMI or SDI ready. Install and configure your capture devices mentioned above first. Then it should be an option for you to select as your video source. 2. 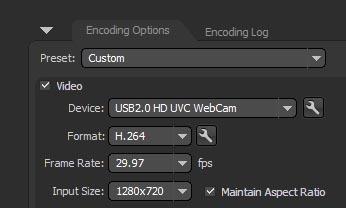 Select h.264 for your video encoding settings. To reach all the devices, including iOS and Android, you need to be encoding in h.264. Next to that option is a little wrench. Once clicked, you will have the option to select a profile. Choose baseline, and then 3.0, 3.1, or 3.2. Set the key frame frequency to 2 seconds. 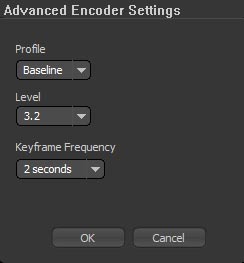 If you start your encoder later and it says you need a profile setting of 3.2, then you know where to return to and select 3.2. 3. Match your frame rate and input size to the source video. Refer to image 1 for reference. 4. 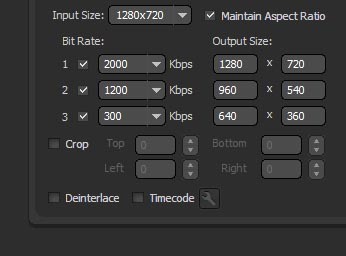 Your bitrates and output sizes refer to what you want the encoded video to be. The player will automatically size itself when placed in a frame. Commonly used platforms such as the Church Online Platform requires your video to be 640x360, so the player will automatically size itself into that requirement. If your viewer takes the video fullscreen, it will show the ratio you've set inside FMLE. 5. Set your audio to your input device, AAC format, 44.1, and 96-128Kbps. Those are our recommended audio settings. Feel free to try different bit rates and land on what you think is best. The AAC audio format is required for reaching iOS devices, like the iPhone or iPad. Windows machines don’t come standard with an AAC plugin but Macs do. If you don’t have that already, you’ll need to purchase it from Media Concepts. 6. 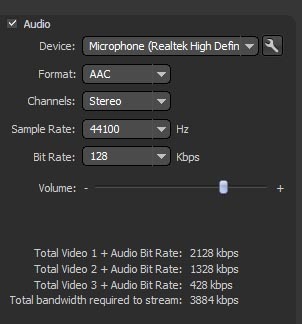 Below the audio settings take note of your total streamed bandwidth. The total video + audio streams need to be within your upload bandwidth provided by your ISP. If you don’t have enough bandwidth, try lowering some of the video bit rates, use 96Kbps audio, and if that’s not enough, consider only 2 streams instead of the 3. Going over this will result in problems with your viewers streaming the content smoothly. 7. 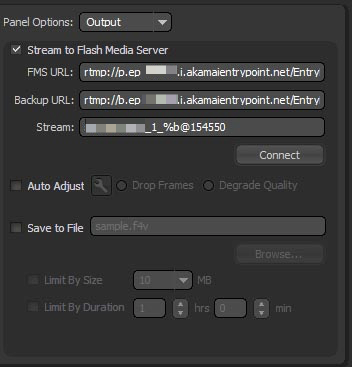 Streaming to Flash Media Servers should be selected under the Output panel option. This is where you tell the encoder to send the video stream. You can point it to the RTMP streaming addresses provided in your streaming details on your Stream Monkey account. Simply copy from your Live Stream details and paste in here. When using FMLE, use the Flash stream name provided. The stream is automatically a dynamic stream and so the Flash stream name will bundle and apply the MBR correctly. 8. Finally, hit Connect and Start! If everything was entered properly, the software will connect to the server when Connect is clicked. When you click Start, it will verify that the encoder options are correct with your video source. Now, go back to your Stream Monkey account and click Preview. You should see your video in action. Congratulations! You are now streaming live. If you have any questions or need help with this process, please feel free to reach out to us for help.